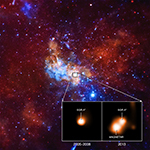 In 2013, astronomers announced they had discovered a magnetar exceptionally close to the supermassive black hole at the center of the Milky Way using a suite of space-borne telescopes including NASA’s Chandra X-ray Observatory. Magnetars are dense, collapsed stars (called “neutron stars”) that possess enormously powerful magnetic fields. At a distance that could be as small as 0.3 light years (or about 2 trillion miles) from the 4-million-solar mass black hole in the center of our Milky Way galaxy, the magnetar is by far the closest neutron star to a supermassive black hole ever discovered and is likely in its gravitational grip. Delta Cephei, prototype of the cepheids, which has given its name to all similar variable stars, was discovered 230 years ago by the English astronomer John Goodricke. Since the early 20th century, scientists have been interested in measuring cosmic distances using a relationship between these stars’ periods of pulsation and their luminosities (intrinsic brightness), discovered by the American Henrietta Leavitt. Today, researchers from the Astronomical Observatory of UNIGE, Johns Hopkins University and the ESA show that Delta Cephei is, in fact, a double star, made up of a cepheid-type variable star and a companion that had thus far escaped detection, probably because of its low luminosity. 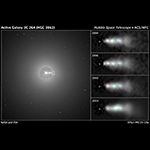 Yet, pairs of stars, called binaries, complicate the calibration of the period-luminosity relationship, and can bias the measurement of distances. This is a surprising discovery, since Delta Cephei is one of the most studied stars, of which scientists thought they knew almost everything.